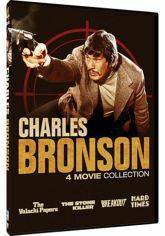 Internationally acclaimed action star Charles Bronson is the definitive on-screen "tough guy." His legendary status was solidified with a series of leading roles in gritty, crime dramas. This action-packed collection showcases his skills with four knockout films! THE VALACHI PAPERS (1972) - Here is the cold-blooded, no holds barred story of Joseph Valachi's explosive testimony while in prison�which exposed unthinkable mob activity in the United States. THE STONE KILLER (1973) - This crime drama is about a tough New York cop who discovers that a gangster is planning a massacre. BREAKOUT (1975) - A Texas bush pilot is hired by a woman to help break her husband out of Mexican prison. HARD TIMES (1975) - In this raw, bare-knuckled view of street brawlers, Bronson stars as a quiet but brutal fighter (who is supported by a sly promoter, played by James Coburn).